Soil infiltrability is an important topic in environmental and agricultural research and influences plant growth, soil erosion and water runoff. In this study, the influences of interactions between soil particles on soil infiltrability were investigated in different MgCl2 and NaCl solutions. 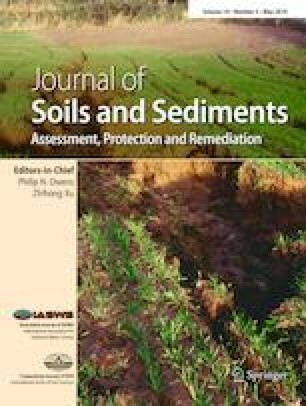 We selected an entisol soil in Chongqing, China. The soil samples were saturated with Na+ and Mg2+: each air-dried sample was weighed into a 5-L beaker and washed three times with NaCl and MgCl2 and then deionised water, respectively. The cationic saturated soil samples were then dried at 333 K, crushed and passed through a 1-mm sieve. For water infiltration, the Na- or Mg-saturated soil samples were added and packed to a bulk density of 1.05 g cm−3 in a rectangular acrylic glass column (20 cm × 3 cm2). The NaCl or MgCl2 solution was selected to leach the soil column with a constant water head, and the depth of the wetted front was recorded at 150 min. For the computed tomography scan, the circular columns of Na- and Mg-saturated soil were wetted by 0.01 mol L−1 NaCl and MgCl2 solutions, respectively, and then were determined by computed tomography scanner when the position of wetting front reached 3 cm. Soil with relatively weak electrostatic repulsion had a net attractive force, which leads to the unbroken soil aggregate and high infiltrability. The calculated net forces at the critical concentration in MgCl2 (0.005 mol L−1) and NaCl (0.25 mol L−1) were attractive and the measured soil infiltrability reached maximum value. The calculations of particle–particle interaction forces also showed that, when the soil aggregate did not break down, the electrostatic repulsive forces caused the soil aggregate to “swell”, which decreased the soil infiltrability. The “swelling” strength in the Mg2+ solution was much weaker than that in the Na+ solution, and the experimentally observed infiltrability values in Mg2+ were much higher than that in Na+ for soil with the same non-breaking aggregates. Soil infiltrability was determined by the electrostatic interactions at the soil/water interfaces, which was generated from the net surface charges of soil particles. The net force between soil particles can be repulsive because of the strong electrostatic repulsion, which results in aggregate breakdown and low infiltrability of soils. This work was supported by the National Natural Science Foundation of China (41101223, 41530855 and 41877026), the Natural Science Foundation Project of CQ CSTC (grant nos. cstc2018jcyjAX0354 and cstc2018jcyjAX0318), Young Elite Scientist Sponsorship Program by CAST (2015QNRC001), the Scientific and Technological Research Program of Chongqing Municipal Education Commission (KJ1501115) and the International Science and Technology Cooperation Program of China (2015DFR70390).